Take a moment to look around your home. Did you spend a lot of time creating and putting up Christmas decorations this year? If so, there’s no reason to put them all away: Many of them can be repurposed for your New Year’s Eve party. 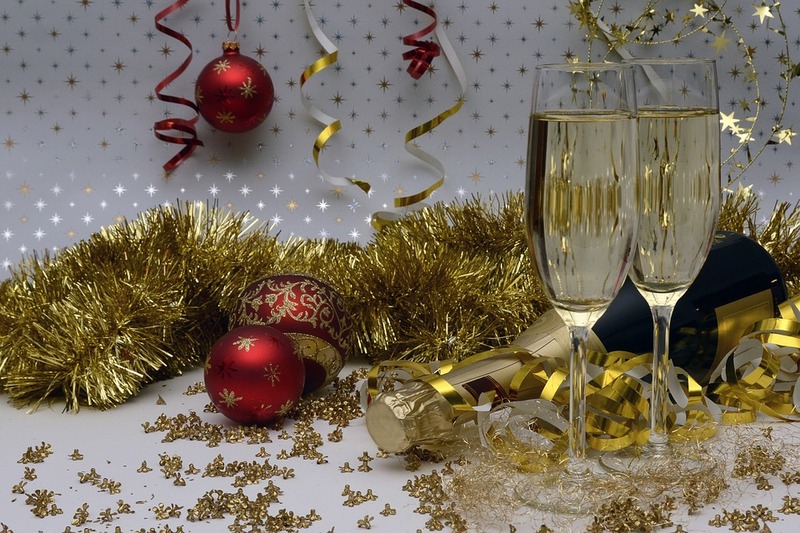 Try out these easy ideas that will make your New Year’s Eve décor a hit with your guests. Tinsel for Party Hats: Make a New Year’s Eve party hat using the strands of tinsel in your Christmas décor. Besides the tinsel, all you need are scissors, ribbon, hot glue, and a few cheap party hats. The dollar store is likely to have some hats you love. One of the best things about this repurposing idea is that you can make a different party hat for each of your guests to wear. Wrapping Paper Confetti: Chances are good that you have a bag of used wrapping paper left over from the Christmas celebrations. Instead of putting all of it in the recycling bin, take some and put it through a paper shredder. Put a few handfuls into plastic sandwich bags and hand them out to your guests. At midnight, they can throw your homemade confetti to celebrate the new year. Twinkling Lights Without the Tree: Take the twinkling, colorful strings of lights off of your Christmas tree and use them as you decorate for New Year’s Eve. One idea is to arrange a few strings on your buffet table to highlight the delicious treats and glasses of champagne awaiting your guests. Or string them around the door to greet guests when they arrive. Other places to put them include around backs of chairs, around pictures, and strung across the mantle. Gift Tags as Place Cards: Gather up the gift tags that were on your Christmas gifts and use them as place cards. Decorate the blank side and attach them to the table cloth in front of each person’s seat. Last New Year’s Eve, I turned my gift tags into place cards by writing each guest’s name in calligraphy using a sparkling gold glitter pen. It looked so elegant! Christmas Ornaments as a Centerpiece: Red, green, and blue ball ornaments can be removed from your Christmas tree and arranged in a decorative bowl for your table’s centerpiece on New Year’s Eve. Maybe you have some pine cones, gold stars, and silver bells you can put into your centerpiece to make it even more festive. Tinsel for the New Year’s Celebration: Why go with plain paper numbers displaying “2018” when you could go with glittery numbers? All you need are foam board numbers, glue, and tinsel. Hang your shiny display on the front door or above the mantle so your guests can enjoy it. Christmas Tree Branches on Display: Before putting your live Christmas tree in a nearby forest or taking it to be recycled, take a small hacksaw and cut off a few branches. Then, find a lovely glass vase or an ornate gold one and arrange the branches inside of it. This will add a pine fragrance as well as beauty to your New Year’s Eve décor. I hope you try one or all of these ideas. Get creative and think about how you can give renewed life to some of your best pieces of Christmas décor!